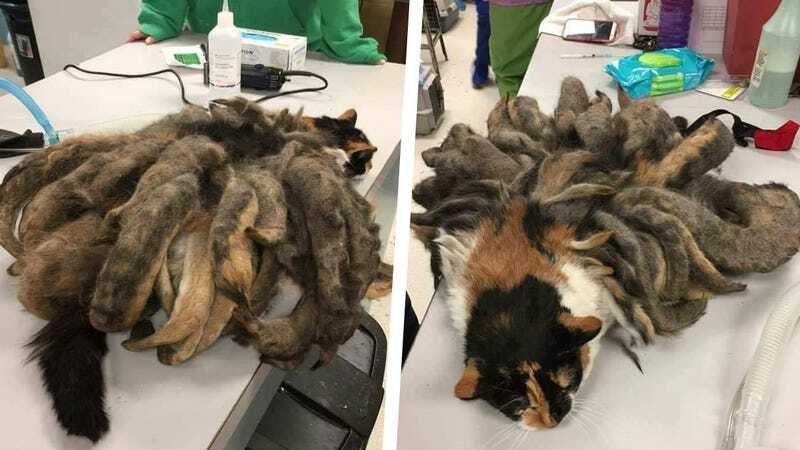 A Pittsburgh man discovered a neglected cat with two pounds of matted fur when he paid a visit to his 82-year-old relative last week. The man brought the poor creature—who he named Hidey because she like to hide—to the Animal Rescue League Shelter & Wildlife Center. The man who found Hidey told PEOPLE that his relative has Alzheimer’s and “doesn’t know anybody anymore,” which is why Hidey was neglected for so many years. He believes Hidey’s fur became so matted because she’s morbidly obese, meaning she can’t properly groom herself. “Please remember to not only check on the elderly in your community, but also check on their animals to prevent instances like this from happening in the future,” the shelter emphasized. 2017 is looking pretty sweet for Hidey. Bless.